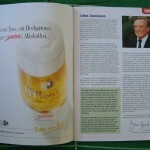 Jancker 6. / Owen 12., 48., 66., Gerrard 45., Heskey 74. 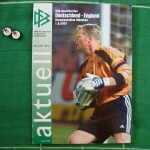 Featuring goalkeeper Oliver Kahn on the cover, the A4-sized DFB official match programme Aktuell contains seventy-eight pages, and was priced at a reasonable three Euros. After the introduction by DFB President Gerhard Mayer-Vorfelder – which contains a short translation in English – there’s a feature on both the ongoing World Cup qualifying campaign and Germany’s preparation for the 2006 tournament, an overview of the matches played between Germany and England, a portrait of Oliver Kahn and an interview with German goalscoring legend and former captain Karl-Heinz Rummenigge. When Germany entertained England in the World Cup qualifier at Munich’s Olympiastadion, Rudi Völler’s side had – amazingly, given the overall weakness of the squad – put together a run that had seen eight wins, one draw and just two defeats. The two losses had both been by the odd goal in Denmark and France, and only two weeks before the game in Munich they had walloped Hungary 5-2 in Budapest. After the previous year’s trauma at Euro 2000 the team were sitting proudly at the top of their qualifying group with sixteen points out of a possible eighteen, six points clear of England who had played one game fewer. The hard work had been all but done: just two home games separated them from a direct route to the World Cup finals in Korea and Japan the following year. Sven-Göran Eriksson’s England side had been solid rather than spectacular in their five qualifying games, but came to Munich on the back of an unbeaten run stretching back to the game at Wembley the previous year. The new coach had yet to taste defeat and had at times been rather fortuitous, but the mood in the England camp was far more positive than it had been for a long while. The team had a completely new look it, particularly in defence, where only Gary Neville remained from the side that had been beaten at Wembley. The midfield had seen the introduction of the hard-working playmaker Steven Gerrard and another new man, Emile Heskey, partnered Michael Owen as part of a two-man attack. The statistics were firmly in the Mannschaft’s favour: they had been unbeaten at the Olympiastadion since a 1-0 friendly reverse against Yugoslavia in 1973, and had only lost one World Cup qualification match in more than sixty years – a single-goal defeat at the hands of Portugal in Stuttgart in 1985. 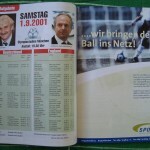 The qualifying campaign for the 2002 finals had seen Rudi Völler’s side score thirteen goals in their six games as opposed to England’s comparatively paltry seven in five, and nobody expected anything less than a win for the home team. The defensive frailties were still present – best illustrated by a lucky 2-2 draw in Finland that kept the team’s incredible World Cup qualifying record away from home intact – but many believed that the demons of Charleroi and Rotterdam had been well and truly exorcised. Whether it was through luck or design, I wasn’t able to see the match live. When the two teams were kicking off in what would be the final international fixture at the historic Olympiastadion, I was on a coach travelling back home from the Polish port city of Danzig. With no access to live commentary, all I had to rely on was the flaky Polish mobile telephone service and text messages from my brother; these were, of course, the days before the mobile Internet and all that wonderful nonsense. After what had been a fantastic holiday circumnavigating the fascinating square-shaped country that sits on Germany’s eastern border, I had not been in the best of moods: on our penultimate day in the country, my wallet went missing – dropped or more than likely pickpockted – at the railway station in Bydgoszcz. Having broken into what I had intended to be a souvenir 100 Złoty note, I was desperate to get home: my hope was that the Mannschaft would brighten the day. It had all started so brightly. With just six minutes on the clock, Michael Ballack – who had really started to develop as a creative force in the German midfield – lifted what looked like a hopeful ball into the England box. The diminuitive Oliver Neuville was somehow able to beat a posse of England defenders in the air, nodding across for the unmarked Carsten Jancker, who stabbed the ball with his right boot past David Seaman. The crowd roared in approval and Jancker – much derided in England after his performances at Euro 2000 – charged towards the corner flag in celebration. Our coach was a few kilometres west of Koszalin, and the first text message had come though. Jawohl. This would be as good as it would get for Völler’s not-so-merry men in green however. The visitors were level six minutes later, and from that point on the match slowly descended into what could best be described as the stuff of nightmares as the ghosts of Rotterdam once more crept out of the shadows with a vengeance. England’s equaliser – or rather, the shocking German defending that allowed England’s equaliser – was like the sort of thing you’d see at a pub team game. After everyone has had more than a few jars. It all began when Michael Owen was bundled over by Sebastian Deisler when going nowhere; from what should have been nothing, England won a free-kick a few yards in from the byline and left corner flag. David Beckham swung the ball in, but there was too much on it for Steven Gerrard at the far post; Gary Neville then nodded it back into the area, Oliver Kahn charged forward and flapped at thin air, Nick Barmby unselfishly nodded the ball into space, and Owen slammed it into the inviting net. With the German defensive line looking increasingly vulnerable – not to say clueless – it seemed only a matter of time before there would be another mistake, another mistimed challenge, and another England goal. The men in white had to wait until deep into injury time for their second goal to come. There was yet another another needless foul as Jens Nowotny was late on Beckham, who took the free-kick himself. His cross was blocked, but on being given a second chance he curled the ball to the edge of the box where it was smartly touched back by the leaping Rio Ferdinand. It fell to Steven Gerrard, who found the back of the net from some twenty-five yards. Kahn had no chance, the visitors were 2-1 up, and the whistle blew to signal half-time. The home team had put in an abject defensive performance and were perhaps fortunate to only be the one goal down, but even then nobody could have foreseen the horror that would follow. It only took three minutes of the second half for England to stretch their lead. After the Germans had failed to clear the danger on at least two occasions – as for maintaining possession, forget about it – David Beckham beat two men to craft a cross into the box. The ball was neatly headed down by Emile Heskey into the path of Owen, who swivelled on the half-volley and beat Kahn at his near post. It was a excellently-taken strike by the Liverpool man, but once again Kahn – who was clearly having an off night between the sticks – could have done better. Three became four less than twenty minutes later, and once again it came about as a result of a German lack of concentration. On this occasion it was Ballack, who allowed himself to be robbed of the ball by Gerrard before the Liverpool man found his club mate Owen with the perfect pass. Emile Heskey looked suspiciously offside as the ball was played, but Owen did what came naturally and scooped his shot over Kahn to complete what was the first hat-trick by an England player against Germany since Geoff Hurst’s in 1966. By this time, I had started to ignore the incoming text messages. Rudi Völler’s side could not wait to get off the field fast enough, and by the time Emile Heskey – yes, Emile Heskey – scored England’s fifth the ground had already begun to to empty. Once again the defence had been caught cold as Paul Scholes played the perfect square ball for Heskey, who outsprinted an almost static Marko Rehmer before slotting the ball past Kahn. When the final whistle blew at 5-1, it was Germany’s biggest defeat since their 6-3 loss to France in the 1958 World Cup, and their largest defeat at home since 1931 when they were hammered 6-0 by Austria in Berlin. It may have been another convenient dose of fate, but when I returned to my small flat in Hampshire I discovered that the timer on the VCR had messed up and that the recording had failed – not that I would have wanted to watch it anyway. I was also dumped by my girlfriend not long afterwards – which was almost as bad as seeing Heskey serve up his “cricket score” celebration. It remains the one of the few Germany v England games that I have not watched in its entirety: the highlights have always been more than enough for me. 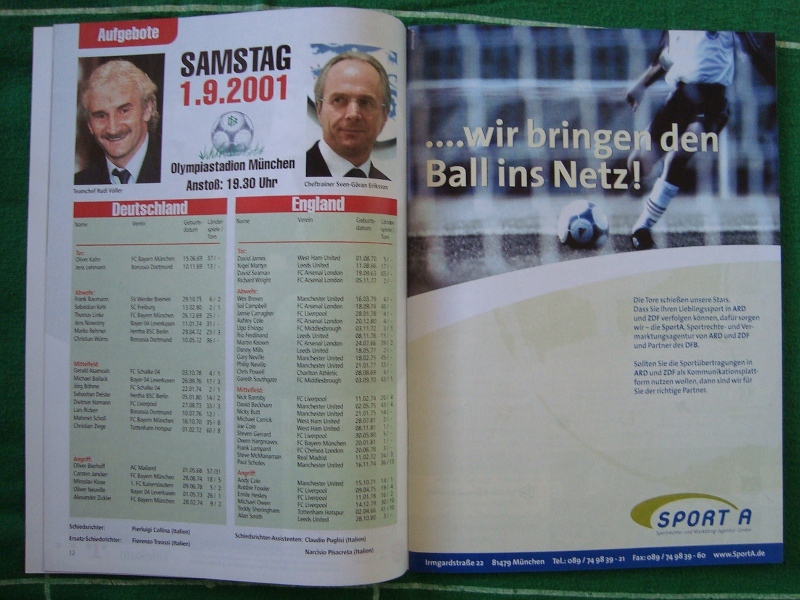 Things didn’t get any better from there for the Mannschaft; the goal difference advantage they held over England had now been turned on its head, and after England had beaten Albania 2-0 Völler’s team were level on points with the Three Lions but only sitting in the play-off position. The final group games saw Germany play Finland and England play Greece, with both games being played at the same time. In Gelsenkirchen a dour Finnish outfit had shut up shop against a German team that seemed to have retreated back into the mental shell of Euro 2000, while at Wembley Greece were giving Sven-Göran Eriksson’s side more than a run for their money: with the final whistle approaching in both matches, the Greeks were holding a shock 2-1 lead while the Finns were still holding firm at 0-0, courtesy of some stout defending and atrocious German finishing. 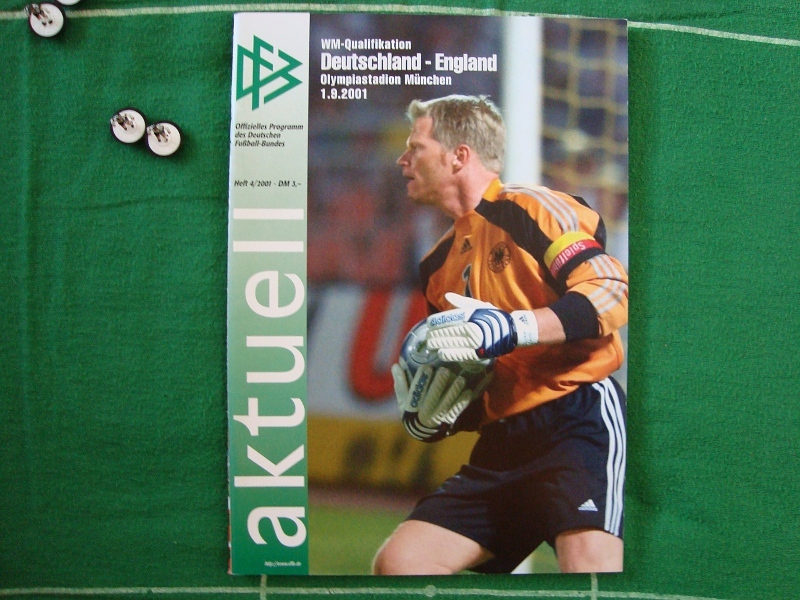 This meant that at that moment Germany held top place by a single point – a situation that would reverse itself when David Beckham produced a memorable injury-time free-kick to level things up at Wembley. With both games being drawn, England took the top place and with it the direct passage to the World Cup finals, while the Germans found themselves consigned to a two-legged play-off against the Ukraine. Faced with the potential ignominy of not qualifying for the World Cup finals for the first time in their history, the Germans pulled out the stops to destroy the Ukrainians 5-2 on aggregate to finally book their ticket to Korea and Japan. The team could have best been described as bipolar: when things went their way they were able to hold things together, but as soon as the rot set in the traditionally strong German attributes such as organisation and team spirit would fall away alarmingly. They had been clueless against England and completely bereft of ideas against Finland, but, driven by an inspired Michael Ballack, they had looked as good as any of the other leading tournament contenders against the much-fancied Ukrainians. One was left wondering which German side would turn up at the World Cup finals. In the end, German supporters need not have worried as what was essentially the same very ordinary team that had been flattened in Munich – with the addition of a certain Miroslav Klose – made it all the way to the World Cup Final itself against Brazil. Somehow the defence, marshalled by the dominant Oliver Kahn, had been able to hold firm all the way to the very end – failing only when Kahn’s first real error of the tournament let in Ronaldo to score the opening goal for the opposition. Up until their 2-0 defeat in the final, the Germans had scored fourteen goals and conceded only one in their six matches. Meanwhile, England once again had flattered to deceive, exiting at the quarter-final stage. It would be six years until the two sides would meet again in 2007, by which time the pendulum would have swung dramatically back and forth yet again. 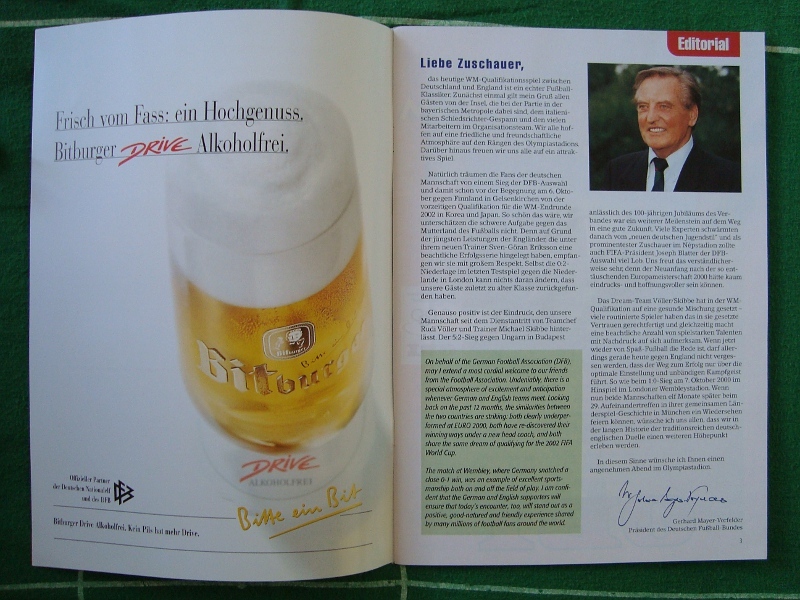 Having failed at Euro 2004 under Völler and rediscovered themselves at home two years later under Jürgen Klinsmann, the Germans – now under Klinsmann’s former assistant Joachim Löw – already had one foot in the finals of the 2008 European Championships. England on the other hand had once again blown out in both 2004 and 2006 under Eriksson, and now under new manager Steve McClaren had found themselves in a tight three-way Euro 2008 qualifying scrap with Russia and Croatia. Germany’s visit would see them line up for the first time at the new Wembley Stadium – where, once again, it would be business as usual. Away: played 11, won 5, drawn 0, lost 6. Goals for 11, goals against 25. Overall: played 29, won 11, drawn 4, lost 14. Goals for 34, goals against 63. Competitive: played 11, won 6, drawn 2, lost 3. Goals for 14, goals against 16.